“A Game Plan for Eating Well in Atlanta,” Kim Severson, New York Times (January 29, 2019). “女藝術家操刀｢百福光｣燈飾展出 閃亮1個月,” Albert Wu, World Journal (November 13, 2018). “Breath of fresh air,” Monocle (November 3, 2018). “Inflatable installations will light up Buford Highway’s Pinetree Plaza,” Muriel Vega, Atlanta Magazine (November 1, 2018). “Artists seek to create sense of welcome and play on Buford Highway with BuHi Lights,” Gabrielle Sorto, ArtsATL (October 30, 2018). “New Chamblee Doraville Community Improvement District raises hopes, concerns,” John Ruch, Reporter Newspapers (October 28, 2018). “AJC Fall Dining Guide 2018: Dining along Buford Highway,” Ligaya Figueras, Atlanta Journal-Constitution (October 19, 2018). "Executive Profile: Marian Liou loves Buford Highway," Mollie Simon, Atlanta Business Chronicle (August 3, 2018). "How Southern food has finally embraced its multicultural soul," Gustavo Arellano, Time Magazine (July 26, 2018). "Buford Highway group to compile residents' stories," Dyana Bagby, Reporter Newspapers (March 17, 2018). 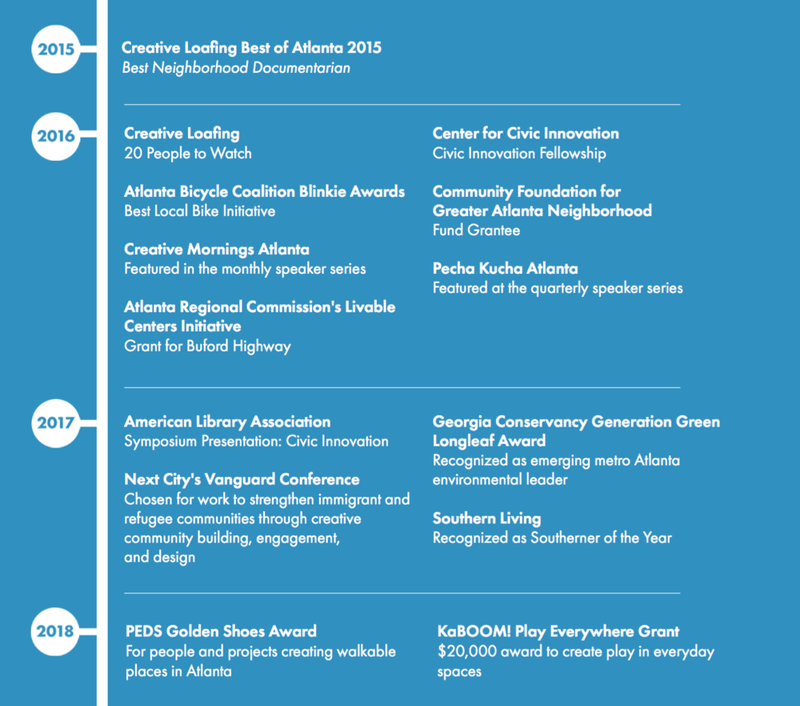 "'Golden Shoe Awards' honor walk-friendly people and places," Collin Kelley, Atlanta Intown (January 25, 2018). "Sandy Springs, We Love BuHi win pedestrian-friendly 'Golden Shoe' awards," John Ruch, Reporter Newspapers (January 24, 2018). "3 Metro Atlantans named 'Southerners of the Year,'" Becca J. G. Godwin, Atlanta Journal-Constitution (November 20, 2017). "We Love BuHi hosting Día de los Muertos fest, parade in Brookhaven," Dyana Bagby, Reporter Newspapers (October 27, 2017). "The Campaign to Fix Atlanta's Most Dangerous Street and Preserve Its Immigrant Cultures," Angie Schmitt, Streetsblog USA (September 21, 2017). "At Atlanta's Living Walls 2017, A Spotlight on Latinos in the South," Richard Villegas, Remezcla (September 21, 2017). "Scenes from Buford Highway block party, night market," Dyana Bagby, Reporter Newspapers (September 18, 2017). "Living Walls, We Love BuHi Partner for a More Walkable Buford Highway," Gabbie Watts, WABE (September 14, 2017). "Get a taste of 9 restaurants during Buford Highway Restaurant Week," Yvonne Zusel, Atlanta Journal-Constitution (September 7, 2017). "Can a public art festival change the way residents and developers see Buford Highway?" Debbie Michaud, Atlanta Magazine (September 6, 2017). "Buford Highway gears up for arts, street life event," Dyana Bagby, Reporter Newspapers (September 1, 2017). "Beltline Founder Turns Focus to Buford Highway," Dyana Bagby, Reporter Newspapers (August 18, 2017). "Big, and Little, Art Coming to Buford Highway," Dyana Bagby, Reporter Newspapers (June 27, 2017). "Rethinking Buford Highway: An Interview with Marian Liou," Adam P. Newman, Atlanta Studies (April 13, 2017). "We Love BuHi and Southern Foodways Alliance Partner to Tell Buford Highway Stories," Chris Fuhrmeister, Eater Atlanta (March 8. 2017). "Living Walls murals coming to Buford Highway," Dyana Bagby, Reporter Newspapers (March 8, 2017). "We Love BuHi awarded Community Foundation for Greater Atlanta grant," Dyana Bagby, Reporter Newspapers (November 17, 2016). "Guest column: Buford Highway is Atlanta's love glue," Marian Liou, Brookhaven Post (November 10, 2016). "Buford Highway to get first ever Halloween parade and pop-up park," Joshua Sharpe, Atlanta Journal-Constitution (October 21, 2016). "Transforming Buford Highway," Albert Wu, World Journal (October 18, 2016). "Trolley Tour Shows Hidden Gems, Stories of Buford Highway," Dan Raby, WABE (August 19, 2016). "Opinion: A vision for Buford Highway," Marian Liou, Reporter Newspapers (June 11, 2016). "Tour Highlights Changes Along Famous, Eclectic Buford Highway," Michael Kahn, Curbed Atlanta (May 2, 2016). "On 'bus crawl,' BeltLine creator pitches ways to save Buford Highway," John Ruch, Reporter Newspapers (April 28, 2016). "Buford Highway 'bus crawl' to ride MARTA to food stops," Reporter Newspapers (April 13, 2016). "Podcast: Helping Local Ethnic Restaurants Flourish Through Soclal Enterprise," Strong Towns (April 13, 2016). "Torpy At Large: By bike or by bus, Buford Highway can be a wild, tasty ride," Bill Torpy, Atlanta Journal-Constitution (March 30, 2016). "Meet the Woman Who Wants Buford Highway to Love Itself," Dennis Attick, Eater Atlanta (March 18, 2016). "Marian Liou expands the conversation about Buford Highway," Muriel Vega, Creative Loafing (March 9, 2016). "Creative Loafing's 20 People to Watch in 2016," Maggie Lee, Creative Loafing (December 31, 2015). "Industry Insiders Pick Atlanta's Best Dining Neighborhood in 2015," Chris Fuhrmeister, Eater Atlanta (December 29, 2015). "Local organization giving love to Buford Highway," Brent Barron, Neighbor Newspapers (December 24, 2015). "'We Love BuHi' aims to promote, protect Buford corridor," John Ruch, Reporter Newspapers (November 13, 2015). "Exploring Atlanta's food scene - by bike," Ligaya Figueras, Atlanta Journal-Constitution (October 2, 2015). "Street scenes: Best neighborhood documentarian," Creative Loafing (September 17, 2015). "Falling in love with Buford Highway," Angela Chang, World Journal (August 12, 2015). "Buford Highway Bikes and Bites," Discover DeKalb (August 3, 2015).